It’s been a great few days off for Thanksgiving, so great I’m a little sad about going back to work tomorrow. Oh well, back to the grind. 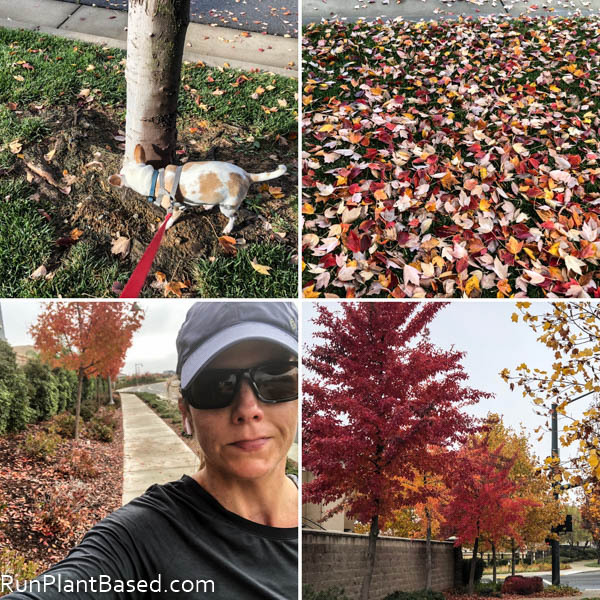 Thanksgiving started with an easy 4-mile run in the chilly wind. I didn’t mind, so great to see clouds and fall lease everywhere after smoke and dryness during the fires. 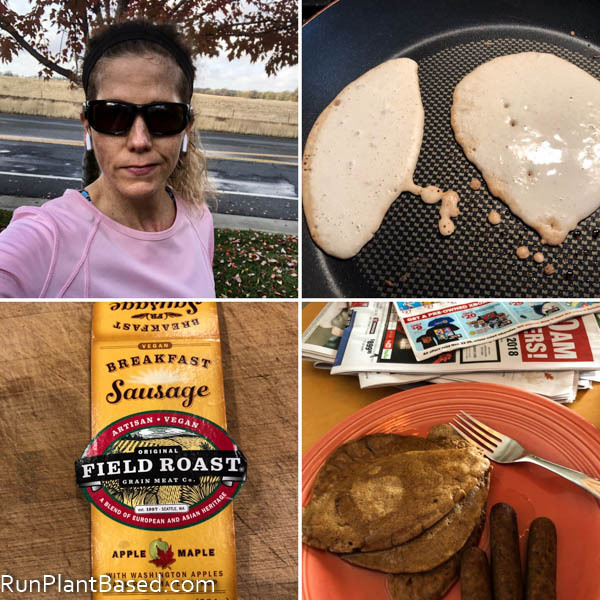 After the run, I made simple vegan pancakes and hubby air-fried Field Roast Vegan Breakfast Sausage for a splurge holiday breakfast. The sausages were delicious with great texture. After relaxing, watching the parade, working on house projects, and cooking, we packed up and headed to my sister’s house for a smaller Thanksgiving gathering that I took two Gardein Holiday Roasts to. You can never have enough and leftovers are always great. 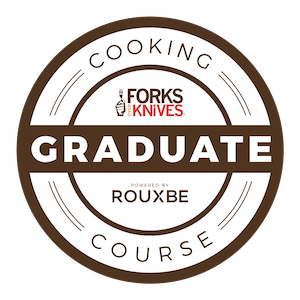 We paired them with a lot of veggie sides – roasted acorn squash, roasted sesame brussels sprouts with apple, mashed potatoes, and plenty of gravy. 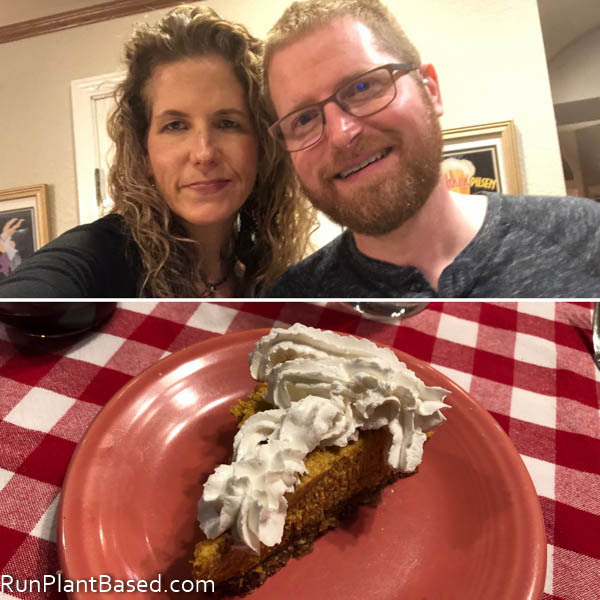 And finished off the feast with the raw vegan pumpkin pie I whipped up. It was a fun and relaxing day, just enough fun in the kitchen and company without being stressful. Friday it was cold, windy, and rainy all day which is great for this area and a great excuse to stay home all day. 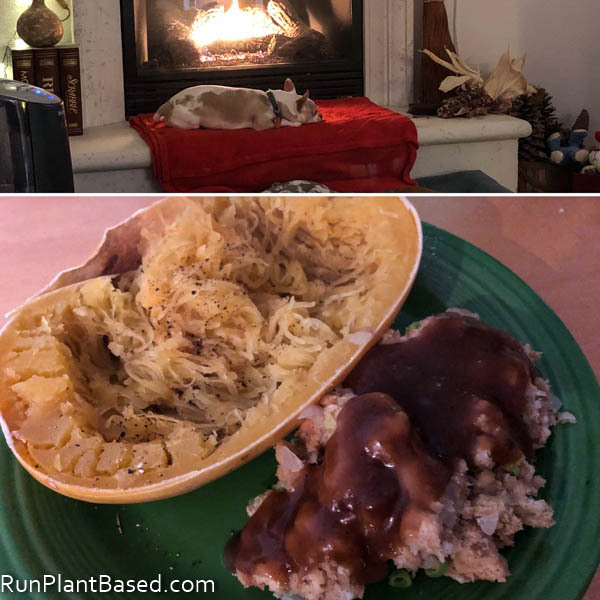 So we did with the fireplace on, watched movies, ate leftovers, and made vegan stuffing for dinner with lots of leftover gravy for another fun treat. 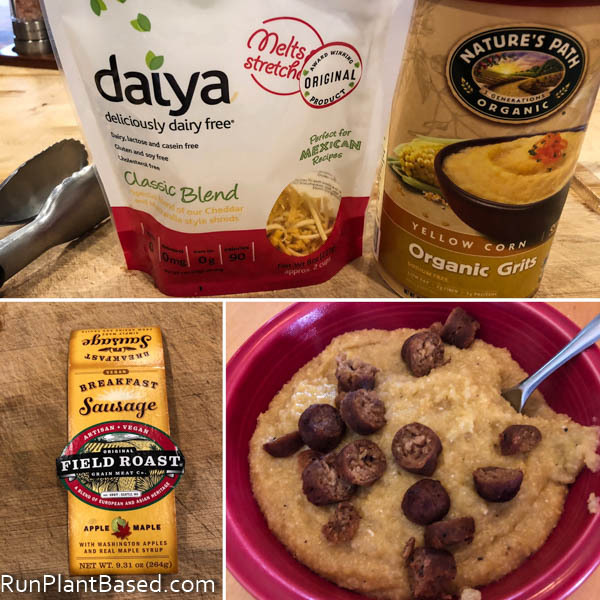 Saturday started with cheesy, gooey grits cooked with veggie broth and Daiya Cheddar and Mozzarella melted in and more Field Roast vegan sausage added to it for a decadent, pre-gym breakfast. 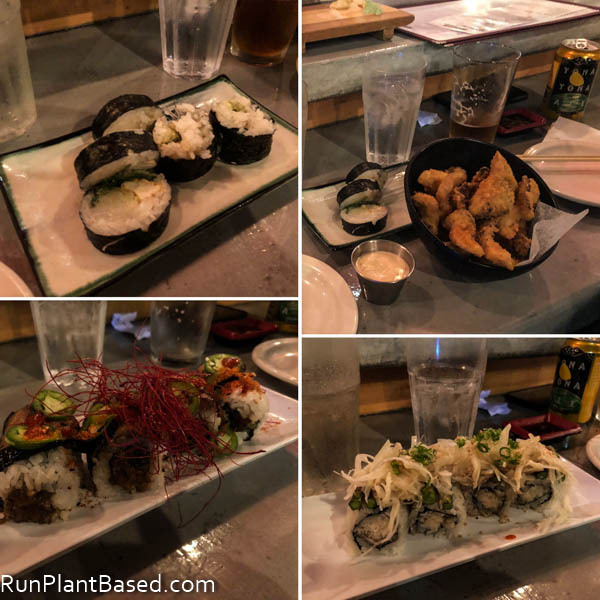 And decided to get out of the house last night and take a break from Thanksgiving leftovers for vegan sushi from Lou’s Sushi. I love that they has such a huge vegan menu with so many creative rolls. We were seated at the sushi bar where couples on either side of us were ordering from the vegan menu too. We had to start with the vegan mushroom tenders because they are so freaking delicious. Then shared three rolls and left very happy. This morning was perfect for a run and dog walk, cool, foggy, but not windy or too cold. And just wow on the fall colors! We crammed a lot in today catching up on chores, decorating the house, getting and decorating the Christmas tree and I am wiped so to the list! This is a cute story about spreading veganism. Looking forward to this new Mississippi Vegan Cook Book. Singer Bryan Adams encouraging veganism. New inspiration for enjoying watermelon. The history and science of veganism. 18 awesome vegan items from Costco. Coffee vegan leather shoes? Cool. How to stop using so much disposable plastic. Free Eat More Plants! cookbook. Brilliant feast! 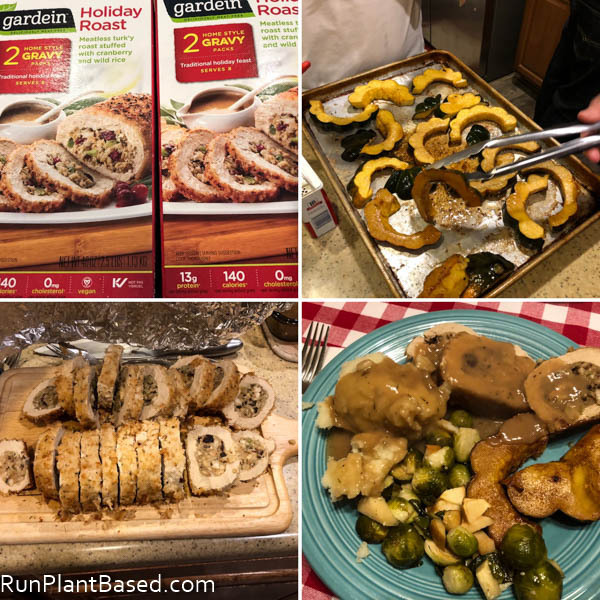 This was my first year trying the Gardein roast too, and I was pretty impressed. I actually went to two Thanksgiving celebrations and got to try a grand total of four different roasts, and this one still held its own quite admirably. Probably #2 or 3 overall, which is great since there were no losers. 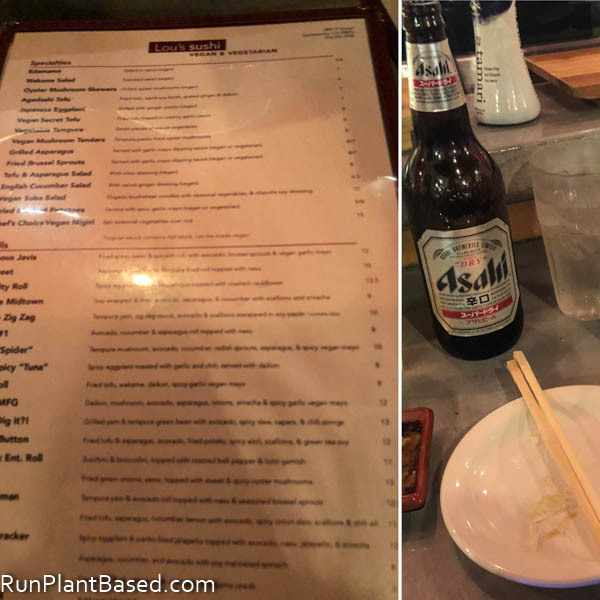 Lou’s Sushi is on my bucket list… Oh, how I dream of those creative vegan rolls! I wish more places would try something beyond the standard cucumber and avocado offerings. That is awesome on the roasts, score! There are so many options now. Yes on Lou’s Sushi, maybe during VegFest? Such a great place! Loving the roasted squash and Brussel Sprouts in this recipe. Ok, now I have a Brussel Sprout story. The last (I’d say) 10 times I’ve purchased Brussel Sprouts from the “high-end” luxury grocery store in our town, and sliced them open to roast….they have had tiny, white worms crawling everywhere in them! In fact, no less than maybe 20 tunnels the worms were crawling up and down in. I think I’m gonna die! Definitely not vegan. Right?!? Even when the sprouts are in my fridge and I wait a few days until splicing them open, the worms are still there. Crawling around even after living in a cold fridge for 3-4 days. So I’m pretty much done with Brussel Sprouts. My friend in the area noticed the same problem. Ewww. Thanks, those are my kind of Thanksgiving sides. Ewww on the brussels sprouts and I have never seen that before here – crazy! Maybe try from a different store? Gardein’s holiday roast was at our Thanksgiving table, too. So delicious!! Thanks for all of the great links, I’m especially interested in the coffee leather shoes. So cool! Yes and it is with the stuffing, it was preferred by non-vegans at our gathering. :-) Agreed, very into this new generation of eco-friendly plant-based “leather”.